Morgan Hill is one of Silicon Valley’s rare gems: a getaway destination that's both full of opportunity and easily accessible, just minutes from South San Jose. It is the home to world-class cycling and hiking routes, championship golf courses, award-winning wineries, pick-your-own farms, and boutique retail shops and fabulous restaurants. Take a stroll through our vibrant downtown or seek adventure in our abundance of fresh air and rolling hills. Morgan Hill has long been a destination for serious and recreational cyclists alike. We have a passionate and deep-seated bike culture and are proud to be the home and headquarters of Specialized Bicycle Components– an industry leader in cycling technology and bicycle manufacturing. You can find Specialized and other bike brands at Bike Therapy a Downtown boutique bike shop. Get fitted for a new bicycle to take for a spin on the roads or trails in our beautiful city. In just the span of a few blocks, you’ll experience more than 30 unique dining options in Downtown Morgan Hill, from a local-favorite Bánh mì stand to our upscale restaurants such as the famed Ladera Grill, winner of the Wine Spectator Award of Excellence four years in a row! Visit any of our award-winning wineries located in one of the oldest premium wine regions in California. Daily tasting and a wide range of varietals are available at most of the wineries. Many locations offer tours, special festivals, concerts and dinners. Experience the beauty and richness of Guglielmo Winery – a third generation, family owned winery since 1925 – or a newer boutique winery like Lion Ranch where the winemaker can share their unique story of how they got into the business while pouring a glass of their latest viognier. Cherries to strawberries or peppers to pumpkins we have dozens of farms and ranches where you can pick fresh produce, pet the animals and learn about where your food comes from. For some of the sweetest fresh and dried locally grown fruit visit Andy’s Orchard who has been winning rave reviews since the 1950’s. Our historic downtown offers charming boutiques, interesting public art like a 10x10 tarantula, a year-round farmers’ market, and special events and festivals that attract over 250,000 visitors each year. 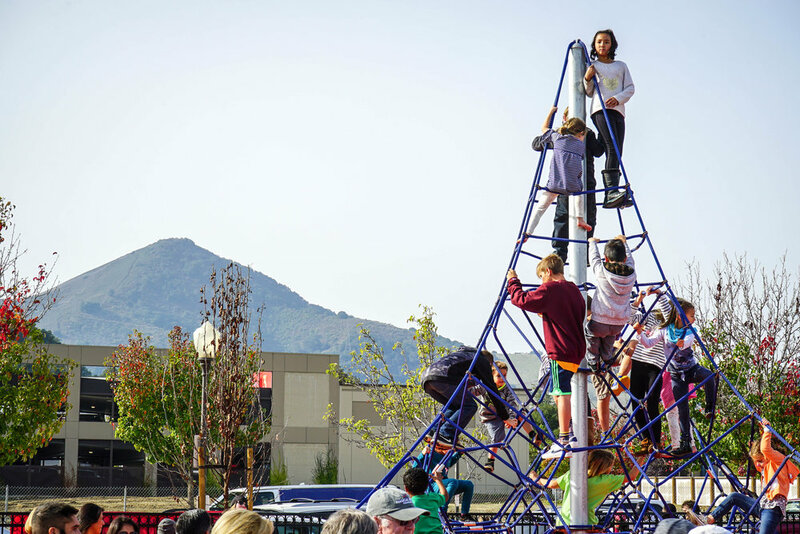 Popular events such as the Mushroom Mardi Gras, the Fourth of July Parade, FREE Friday Night Music Series and the Taste of Morgan Hill are family favorites. You can take part in your choice of art walks, brew crawls and wine strolls, or attend live theatre and dinner shows throughout the year. Right in our backyard, you’ll find Henry W. Coe State Park – the largest state park in Northern California – with its rugged, beautiful terrain. The park is open year-round for hikers, mountain bikers, backpackers, equestrians, car campers, picnickers, photographers and people who simply like to visit parks. Golf enthusiasts can tee off at the Jack Nicklaus designed Coyote Creek Golf Club, – or the masterpiece that is Rosewood CordeValle’s course designed by acclaimed outdoorsman/golf enthusiast Robert Trent Jones Jr. You can be sure to enjoy some of our amazing year-round weather by diving into the state-of-the-art Morgan Hill Aquatics Center or playing an informal baseball game at the Outdoor Sports Complex. You will find so many things to do in Morgan Hill that you’ll want to extend your stay. You also have a wide range of lodging choices in the heart of Morgan Hill which offer family friendly accommodations for you to rest and get ready for your next day’s adventures in Morgan Hill. You’ll find Morgan Hill to be your closest get-away in Silicon Valley.